Well, he didn't...not exactly. 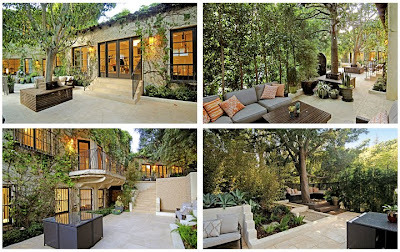 Thanks to the Bizzy Boys at Celebrity Address Aerial we've learned that Mister Statham did not, as it turns out, by Mister Stiller's entire compound in the Hollywood Hills; He bought part of it. 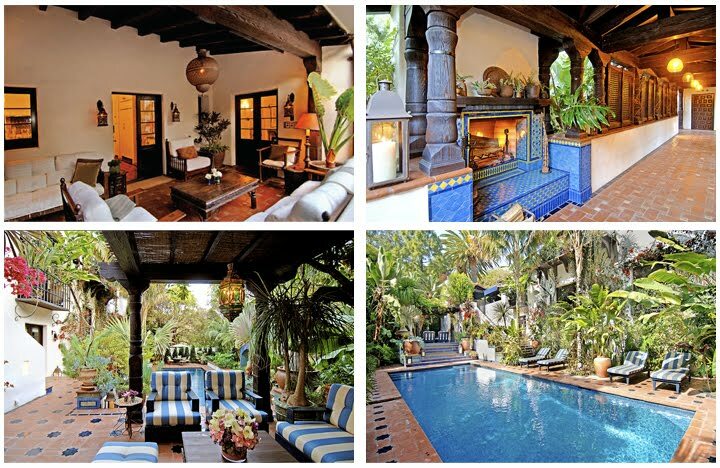 Property records now reveal that Mister Statham paid $7,325,000 through a corporate entity for one of the houses in the Stiller compound, an authentic 1929 Spanish style house re-worked in high style for Mister and Missus Stiller by the talented and in-demand folks at Roman & Williams. 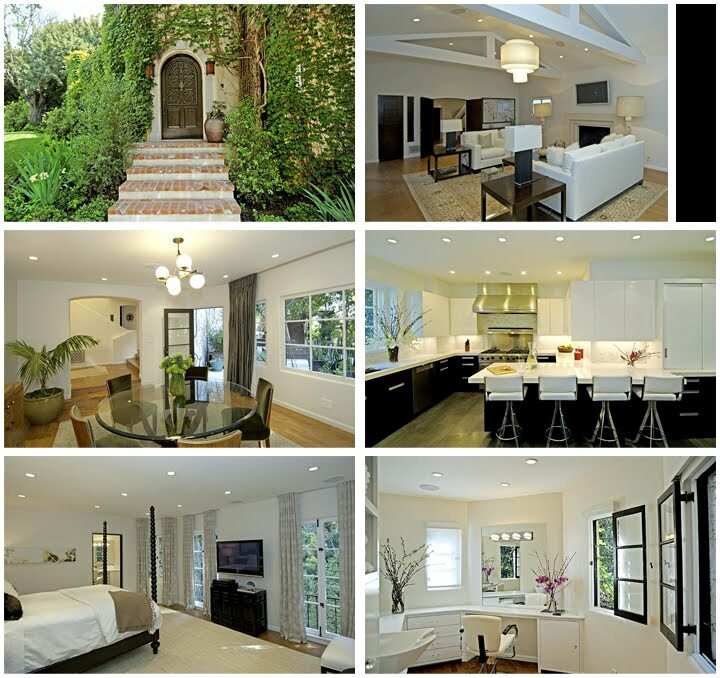 Listing information and marketing materials reveal Mister Statham's new crib in Tinseltown features 4 bedrooms, 4.5 bathrooms, living room with wood-beam ceiling and fireplace, den, period-style kitchen and a lower-level screening room with state-of-the-art equipment. The master suite includes his and her closets/dressing rooms, one for Mister Statham and one, we presume, for his cat walking gal pal Rosie Huntington-Whiteley. The walled, gated and heavily secured property includes a detached garage with guest/staff quarters, lushly landscaped grounds with various outdoor living/dining areas, and numerous terraces, fountains and stair cases with bright multi-colored tile accents. A swoon-worthy swimming pool tucked into the hillside below the house provides the perfect place for Mister Statham and Miss Huntington-Whiteley to sunbathe in the buff in complete privacy. Mister Statham has been on a bit of a real estate whirlwind the last couple years. In June 2009 he paid $10,950,000 for a very contemporary wood and glass ocean front home in the guard-gated and celebrity-stocked Colony community in Malibu (CA). In May 2011 the hunky he-man took a a gut wrenching $343,000 loss when sold a 2,140 square foot condo at the star-stocked Broadway Hollywood building in the heart of nitty-gritty Hollywood for $1,200,000 that he'd bought four years earlier for $1,543,000. Shortly after he unloaded his condo he sold a glassy modernist house above the Sunset Strip for $2,700,000. 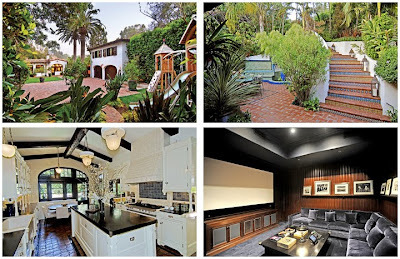 The other house in the Stiller compound–the one that Mister Statham did not buy–is back on the is back on the market all on its lonesome with an asking price of $2,995,000. The fully renovated 4,062 square foot contemporary-tinged casa (above) that current listing information calls a "1930 Classic Spanish Redefined," includes 4 bedrooms, 4.5 bathrooms, a large living room with fireplace, formal dining room, office, cutting-edge eat-in kitchen with stainless steel appliances, and a lower level media room. The second floor master bedroom comes equipped with a sizable walk-in closet, luxurious bathroom and separate celebrity style dressing room with make-up vanity and built-in shampoo bowl. The back of the house opens wide to multi-level tree-shaded terraces with built-in bench seating that ring tree trunks. The house does not have a swimming pool. Mister Stiller and his wife Christine Taylor relocated to New York City where in September 2008 they paid $10,000,000 for a duplex apartment in the same Riverside Drive co-operative apartment house where his comedy legend parents Jerry Stiller and Anne Meara have lived for many years. How much longer until the Stiller divorce is announced? I'm tap dancing fast as I can. Let me know when he looks my way. Statham paid some serious pesos for Outpost, but I love that casa. The other house seems priced well, even without a pool or views. Jason Statham is the sexiest man currently stepping before a moovie camera for pay. Who knew Jason Statham had this kind of money? I've been inside the home and it is spectacular.. probably one of the nicest Spanish homes I've ever seen.